Washington DC — US Secretary of State Mike Pompeo, who took charge of his office on May 2, 2018, has said in response to written questions from Members of the US Senate Foreign Relations Committee that he will publicly ask China to engage in direct dialogue with representatives of the Dalai Lama, without preconditions, to resolve the Tibetan problem. He further said he is committed to pressing for respect for human rights for Tibetans, including freedom of religion and belief, in his conversations with Chinese officials, and advocating for the release of Tibetan political prisoners. He said he will also raise concerns about the lack of regular access to the Tibetan Autonomous Region (TAR) for US journalists, diplomats, academics, and others. “I will recommend that the United States express publicly, and at the highest levels of government,” Pompeo wrote, “that Chinese authorities need to engage in meaningful and direct dialogue with the Dalai Lama or his representatives, without preconditions, to lower tensions and resolve differences.” Although President Donald Trump and then Secretary Rex Tillerson have met senior Chinese leaders several times, they have not publicly raised Tibet with their Chinese counterparts. 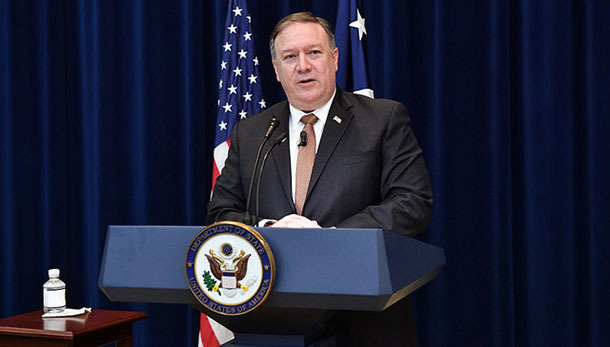 Secretary Pompeo also said he will raise concerns about the lack of regular access to the Tibetan Autonomous Region (TAR) for US citizens, and committed to ensuring that US journalists, civil society, legislators, and scholars have full access to China, including the Tibet Autonomous Region and Tibetan areas. Below is the full text of the questions for the record on Tibet that were submitted by US Senators, and the answers provided by Secretary Mike Pompeo. Question: During the US-China Summit held last April in Florida and in last November in Beijing, President Trump did not raise the question of respect for human rights and the rule of law in China and in Tibet. Since 1997, all U.S. Presidents have publicly challenged the sitting Chinese President to negotiate with the Dalai Lama or his representative to find a lasting solution to the Tibetan issue. If appointed, would you recommend that President Trump calls publicly on the Chinese President to address the grievances of the Tibetan people through dialogue with the Dalai Lama? Answer: I share your concerns about the Chinese government’s repressive policies and lack of respect for human rights in Tibet. If confirmed, I will recommend that the United States express publicly, and at the highest levels of government, that Chinese authorities need to engage in meaningful and direct dialogue with the Dalai Lama or his representatives, without preconditions, to lower tensions and resolve differences. Question: It has long been the policy of the US government, provided by the Tibetan Policy Act, to promote dialogue between the envoys of the Dalai Lama and the Chinese government toward a solution on the Tibet issue that guarantees the respect of the “distinct identity” of the Tibetan people, who continue to suffer under China’s oppressive rule. The dialogue is now at a standstill and, as we have seen, the lack of substantive progress toward a genuine resolution continues to be a thorny issue in U.S.-China relations. The United States has played a key role in encouraging past dialogues. Would you personally commit to pressing the Chinese leadership for a resolution of the Tibetan issue through a speedy resumption of dialogue with the Dalai Lama or his representatives, without preconditions? Answer: If confirmed, I will urge Chinese authorities to engage in meaningful and direct dialogue with the Dalai Lama or his representatives, without preconditions, to lower tensions and resolve differences. Question: Will you commit to explaining to Chinese authorities that the U.S., in compliance with the principle of religious freedom, will recognize and freely interact with the person chosen independently, and through Tibetan Buddhism’s spiritual tradition, through the processes described by the current Dalai Lama, to succeed the current Dalai Lama? Would you also make it categorically clear that the U.S. will not accept a Chinese government controlled selection process? Answer: If confirmed, I will press the Chinese government to respect the legitimacy of Tibetan Buddhists’ religious practices. This includes the decisions of Tibetan Buddhists in selecting, educating, and venerating the lamas who lead the faith, such as the Dalai Lama. Question: The Tibetan people continue to resist injustice without resorting to violence. Since the mass demonstrations of 2008 – where around 200 Tibetans were killed and thousands were imprisoned – more than 150 Tibetans have self-immolated to protest against Chinese rule and for the return of the Dalai Lama in Tibet. Over 600 Tibetans continue to be prisoners of conscience according to the Congressional Executive Commission on China and many more are unreported. Would you ask the Chinese authorities to allow independent humanitarian organization to visit Tibetan political prisoners and the families of Tibetan self-immolators to ascertain their welfare? Answer: Yes. Consistent with the Tibetan Policy Act, if confirmed, I will encourage the release of all those held prisoner for expressing their political or religious views, and will support access to prisoners by international humanitarian organizations to ensure prisoners are not mistreated and are receiving necessary medical care. If confirmed, I will push Chinese authorities to lift restrictions on visits by diplomats, journalists, and NGOs to the Tibet Autonomous Region and Tibetan areas. Question: Hundreds of Tibetan political prisoners, according to the Congressional Executive Commission on China, are in prison as we speak and any form of expression of Tibetan identity, be it religious, linguistic or cultural, can be easily criminalized by the Chinese authorities due to the adoption of a patchwork of regulations that deny fundamental and basic human rights. What will your Administration do for the release of the Tibetan political prisoners? Answer: If confirmed, I will urge China to cease restrictions on the human rights of Tibetans as well as their religious, linguistic, and cultural traditions and practices. I will be committed to pressing for respect for human rights, including freedom of religion and belief, in my conversations with Chinese officials, and advocating for the release of Tibetan political prisoners. Question: China’s censorship and information and communication blockade, specifically in Tibet, prevents reporters from investigating the reality of the situation in Tibet. What steps will you take with the Chinese authorities to ensure that American journalists will be able to freely access Tibet just as Chinese journalists are able to do so in the United States? Answer: If confirmed, I am committed to pushing for reciprocity regarding the open access China and many other countries enjoy in the United States, and will raise concerns about the lack of regular access to the Tibetan Autonomous Region (TAR) for U.S. journalists, diplomats, academics, and others. I will work to ensure that U.S. journalists, civil society, legislators, and scholars have full access to China, including the Tibet Autonomous Region and Tibetan areas. Question: The major rivers of Asia that flow from the Tibetan Plateau and are subject to current and potential dam and diversion projects by China. These projects are planned and implemented without the proper involvement of the Tibetan people, who are the best stewards for the preservation of the delicate environment of the Tibetan Plateau. India and other governments in Asia are increasingly worried about China’s plans to dam rivers originating in Tibet which serve over a billion people downstream. Would you raise the need to fully involve Tibetans in the preservation of Tibet’s fragile environment with the Chinese authorities? Answer: If confirmed, I will encourage all countries to manage their water resources soundly and to cooperate on the management of shared waters. I will specifically urge China to make decisions on major water-related infrastructure projects based on the best science available and in transparent consultation with all affected stakeholders, including Tibetans and the governments of neighboring countries. Question: Will you commit to meeting the Dalai Lama, whether in the United States or during your travel, and to express to him the United States’ support to his peaceful struggle for Tibetan rights? Answer: If confirmed, I will fully implement the Tibetan Policy Act. State Department officials should meet with Tibetan leaders whenever appropriate, including the Dalai Lama in his capacity as an important spiritual leader of the Tibetan people. Question: Tibet: The core piece of legislation guiding US policy toward Tibet – the Tibetan Policy Act of 2002 – established the Office of the Special Coordinator for Tibetan Issues at the State Department, a position that is currently vacant. If confirmed, do you commit to continue the past practice of filling this position? Answer: If confirmed, I will support implementation of the Tibetan Policy Act.